My grandparents have several apple trees in their front yard. I'm not going to pretend I know much about apples or their varieties but these are perfect for baking. They are green and tart and bake so well. With the plethora of apples we've got, I've decided to do an apple challenge for the next few weeks. 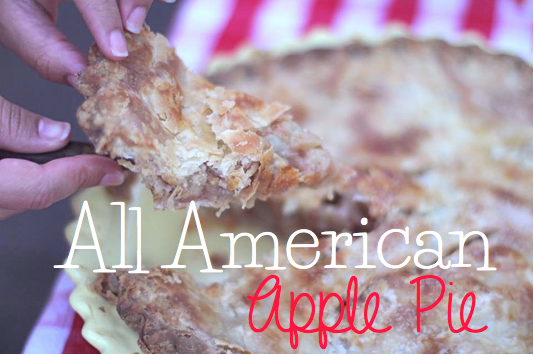 Let this 'All American' apple pie be the first of this challenge. Hopefully I'll discover some new apple recipes that can be repeated for years to come. We made this pie for our 'Endless Summer Garden Party.' As I mentioned before, it had a Lana Del Rey twist, which can be "All American" in a sense. Pabst Blue Ribbon on ice and all things Americana tend to be the theme of her songs, so why not use up some apples while we're at it?! Going along with this whole American theme, the recipe came from a 1950's edition of Better Homes & Gardens that I got from my grandmother. It is one of the best recipes (with a bit of my own changes here and there). • Sift the flour and salt together. • Sprinkle water over mixture and toss with fork. • Form into a ball, by hand. • Place in a plastic bag and refrigerate for at least 30 minutes. Once the dough is cooled, cut in half (one for the bottom crust, one for the top). Roll each out, put between two sheets of wax paper, and place them back in the fridge. Your apples should be already peeled, cored and sliced at this point. While the rolled out dough is chilling, mix the filling. • If your apples lack tartness, sprinkle with about 1 tablespoon of lemon juice. • Combine the sugar, flour, spices and salt. • Dot with butter (meaning: cube the butter and toss it into the mixture). Press the dough into your pie pan and scoop the filling in over it. 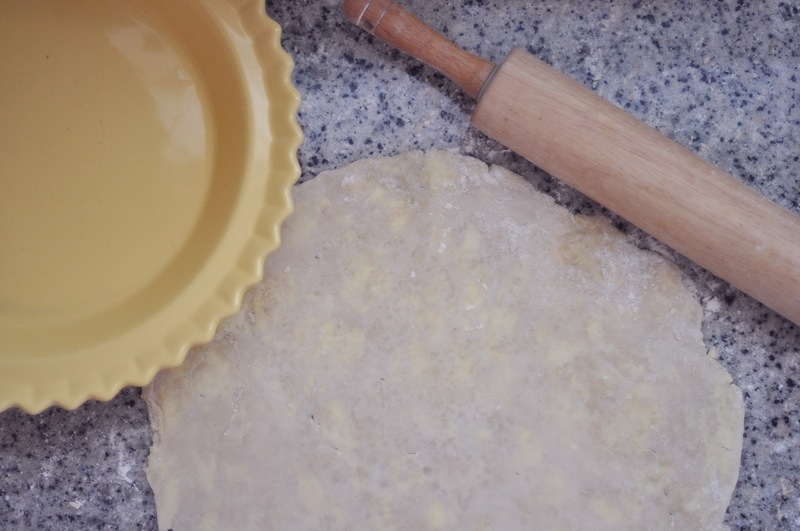 Place the top dough over and connect the two (by pinching them together). Trim the pastry dough in whichever way suits you. My cookbook has an entire page on different trimmings, which is very helpful. If you google it or look on Pinterest, you can find a load of tutorials as well. Using my fingers and pinching is my favorite way. It's called a "scalloped edge," and I was told you normally do it with a spoon. I use my right hand index finger, push it into the dough and pinch around it with my left hand's thumb and index finger. Cut vents into the top center of the dough and place back in the refrigerator for another ten minutes (this ensures the trim keeps it's shape while in the hot oven). Brush half & half over the top and sprinkle with granulated sugar before placing in the oven. Cook at 400º for about twenty minutes and then lower temperature to 375º for the remaining 30 minutes. Photo credits: Top photo by Abby Williamson, edited by me. Remaining photos by me.